A wasp's nest in a yard or close to a home can pose a danger to adults, children and pets alike and requires removal as soon as possible --- especially if any of the people are allergic to wasp venom. There are many tried-and-true methods for killing wasps --- shooting the nest with a spray adhesive among them. The wasps become coated with adhesive and die, and the material also clogs the nest's entrance, preventing any wasps returning to the nest from getting in. Wasps can be killed with spray adhesive as an alternative to pesticides. Plan an escape route. 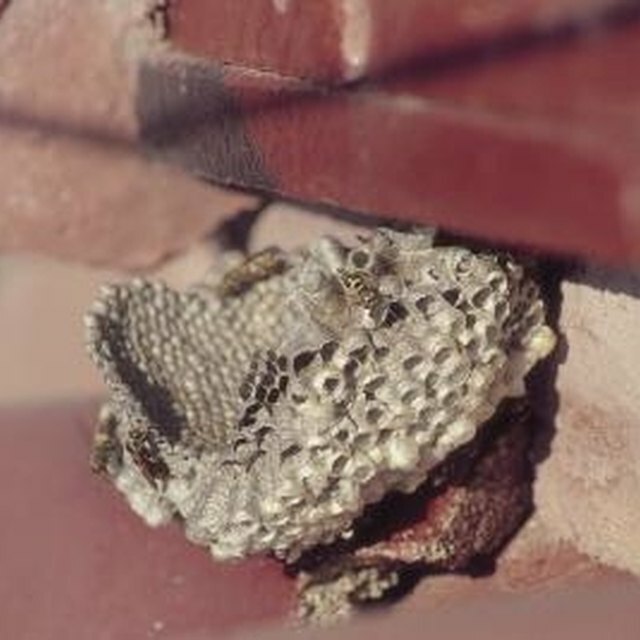 If the nest is near an entrance of the home, do not use that entrance to return to shelter in case any wasps follow after the initial spraying. Use another entrance, or find another means of shelter away from the nest. Wait for the evening, when the majority of the wasps have returned to the nest to rest for the night. Do not wait until the sun is completely down, though, because you don't want to work in the dark. The ideal time to spray is when activity has settled down outside the nest. Evacuate the surrounding area of all other people and pets. Put on layers of thick clothing, goggles, thick gloves and a cap. These items provide protection in case any wasps escape from the nest before it's sprayed. Use duct tape to bind and seal the gloves, sleeves, pants and shoes to prevent wasps from getting into the clothing. Approach the nest carefully so the wasps are not disturbed and come out. Shoot the nest with spray adhesive beginning with the entrance to the nest, and concentrate heavily on that area. Wasps that attempt to exit the nest will become coated with the adhesive, making flight impossible. As the wasps continuously attempt to exit the nest, the entrance becomes clogged and eventually is sealed shut with the wasps that try to escape. Spray the remainder of the nest generously. If any wasps attempt to return to the nest shortly before the adhesive dries, the glue will adhere the wasp to the nest and the wasp will die. Leave the area quickly, since any wasps that were not inside the nest will become enraged and attempt to defend their territory. Wait at least 24 hours before returning to the vicinity. Approach the nest with caution and while wearing safety clothing. If there is still wasp activity around the nest, wait longer to remove and dispose of it. Once wasp activity has ceased, remove and dispose of the nest by tying it up tightly in a thick garbage bag or burning it. This method should not be used to kill bees. This is effective in a wasp's nest because the entrance of the nest will become clogged with dead wasps and prevent any from entering or exiting the nest. Bees will eat the corpses of their dead nest mates that are clogging the entrance, allowing them to get out of the hive and continue to thrive. Consult with your physician prior to treating the hive to diagnose any allergy to wasp venom. If you are allergic, you should not handle the nest at all, since contact with wasp poison can cause serious injury or death. Call a professional pest removal company to take care of the problem. What Can Be Used to Keep Rats or Squirrels Out of Your Attic?